Last week I bought a new Kindle. I was using an old hat to protect it in my backpack but I realized the front was going to get destroyed if I didn’t find better protection. 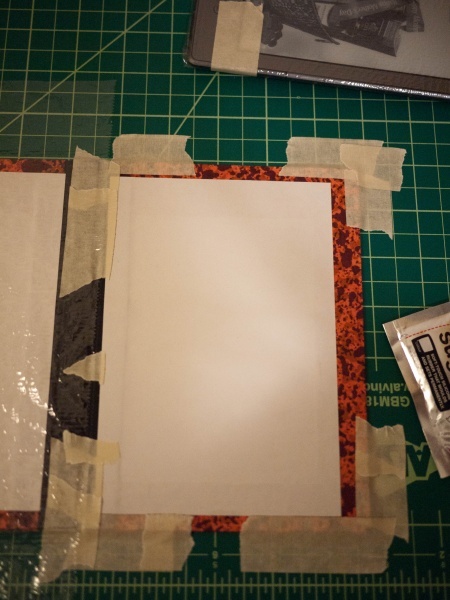 Not wanting to pay half the cost of the device for a store-bought cover I decided to make my own. 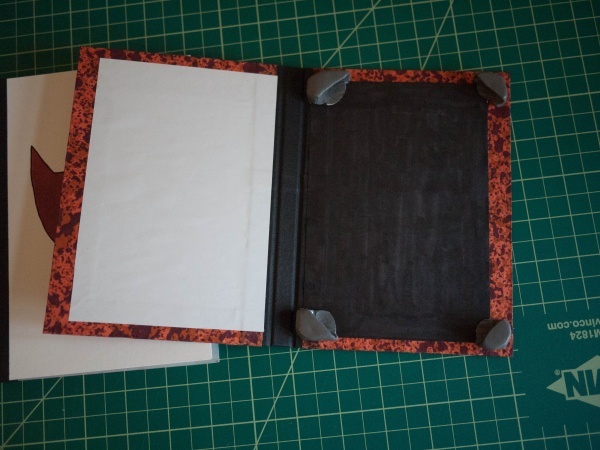 My design is based off of the Instructable Create An iPad or Kindle case from an old book and Sugru. I didn’t feel like ripping up an old book so I made my own. The Instructable also didn’t mention that sugru will get all over everything. Below I’ll also show some tips for protecting the finished surfaces. Let’s get started. Cut the cover boards to size leaving a border of roughly a quarter inch. Not much is required and one could easily go smaller. I think mine were five by seven inches. Also make up a spine support, mine was 3/8″ wide. 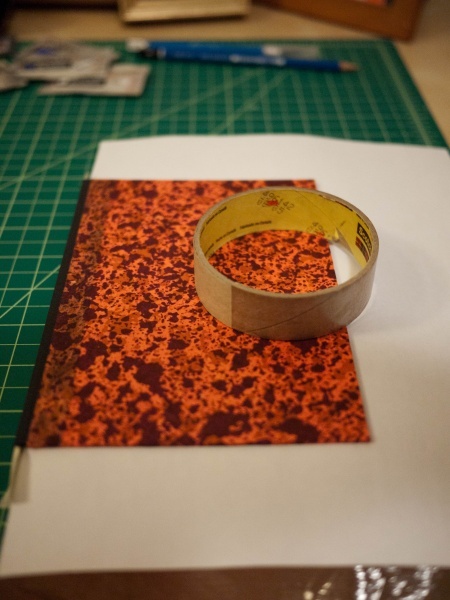 Bind these together with 2″ cloth binding tape. Leave a gap of a quarter inch between the cover boards and the spine support. Use a straight-edge to assure that the boards remain aligned and be sure to carefully center everything with respect to the tape. Use care when “connecting” the hinges between the support and covers. I used a straight-edge to make sure that the tape attached cleanly and left a uniform gap. You can see what happens if you do not carefully join the hinges in the picture below. Not only does it look sloppy, but the uneven joins prevent the covers from connecting evenly when folded back. 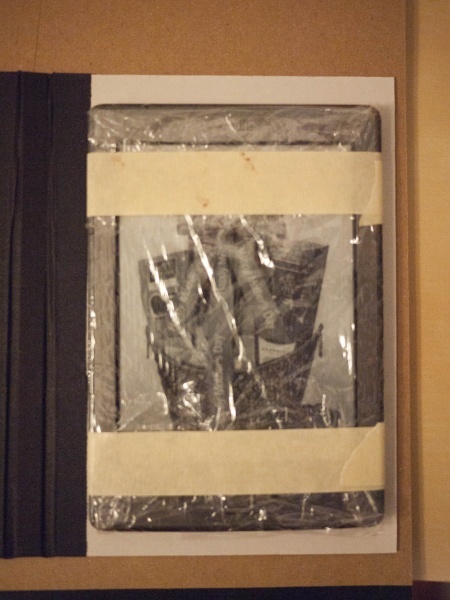 Now cover the kindle with cling wrap and use masking tape to hold it in place. This will protect the kindle from the sugru. Basically follow the Instructable from here on. I made one change though, use masking tape to define the edges of the Kindle and to protect the surfaces around the Sugru attachment points. After molding the attachment points be sure to remove the masking tape. If it sets it may be hard to remove without damaging the paper. I also found that the Sugru attachment points support the front cover and that molding them with this use in mind is very important to achieving a solid feeling cover. Mold the attachment points slightly oversized and press the cover into place making sure that the Sugru presses tightly against the the cover and the inside spine. To protect the front cover from staining use another piece of cling-wrap. I also had issues with the end-pages imprinting the Sugru so I added a sheet of scrap paper to smooth the surface. One packet of black Sugru and one packet of white Sugru makes a grey that is pleasing in relation to the Kindle 4. You can see I markered the inside lining of the Kindle size page black. 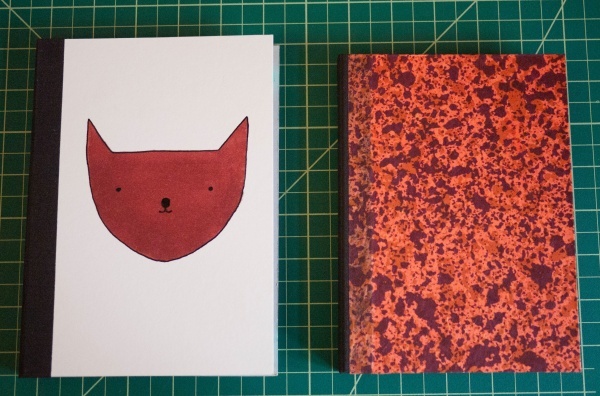 When I first built the cover I made it in the manner of making a book. This didn’t consider that, unlike a book, this kindle cover will be held inside-out and that the white end-paper would contrast with the spine and Kindle itself. 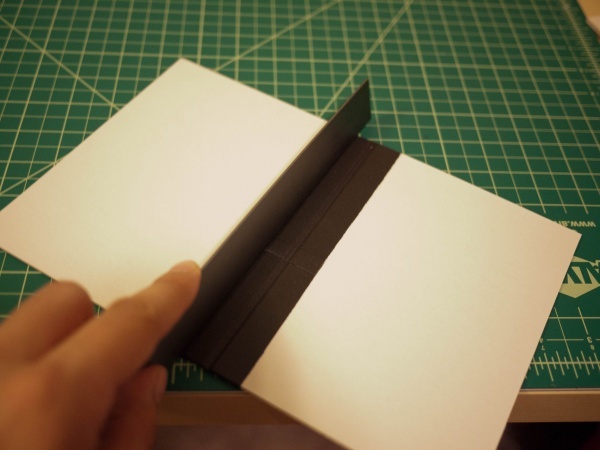 For this reason black or grey paper, or extending the outside cover paper to the inside might make a better background. Another possibility is adding a fun cover picture to the inside cover that will be folded outwards so that people watching you read have something fun to look at.